There was no letter written to the kids the week of Dec. 22; I’d just seen Ellen’s brood and was about to see Reid here in North Carolina. But that doesn’t mean the photos came to a halt. In fact, just the opposite. Reid hooks a heavyweight red … but the beast literally pulled him 20 yards – anchor and all – and broke off in some structure. Our Saturday morning near Charleston was fabulous – sunny and pleasant. I hope Reid likes these environs half as much as his dad. Nothing wrong with camping on a bar stool with Reid on a Friday night in Charleston. Someone has to ride in the last row and virtually the last seat. Might as well be me. Ellen and Emma get into serious mode to ice Christmas cookies. Emma was in motion in the run up to Christmas, and she thinks Papa needs to be a little quicker on the trigger if I hope to get her photo. 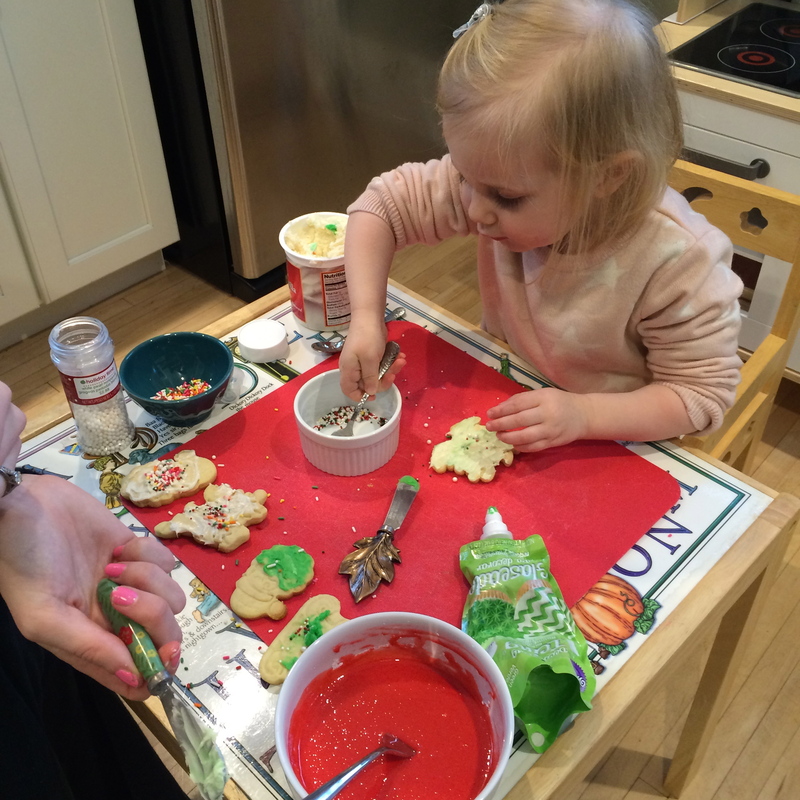 You’ll hear more next week about Emma’s artistry with Christmas cookies – and all things icing. The retirement rock is rolling downhill and gaining speed as it goes. The glimpses I get of that life are pretty appealing and whatever trap doors there are – and there are sure to be some – haven’t reared their ugly heads as of yet. Like most folks, some of my time will circulate around the kids. I hope they’re ready for me. Somehow, the travel companies don’t include scenes like this in their promotional material. Travel isn’t as much fun as it used to be. then wrapped it up the day with another couple of hours at my desk so I wouldn’t be swamped in the morning. The spending spree on the new fishing gear and lumber aside, it’s the sort of non-pressure day a guy could get used to. Of course, they won’t all be sunshine and fishing, but you know where this is going. Really, I can’t wait to get things headed down that road to see what lies ahead. We’ll know soon enough, won’t we? On a related note, I was looking at a folder with a mish mash of recipes, and perhaps that’s my next retirement activity. Imagine a guy trying to sort recipes. The folders would read ‘Steak,’ ‘Potatoes,’ ‘Bread,’ ‘Beer,’ etc. 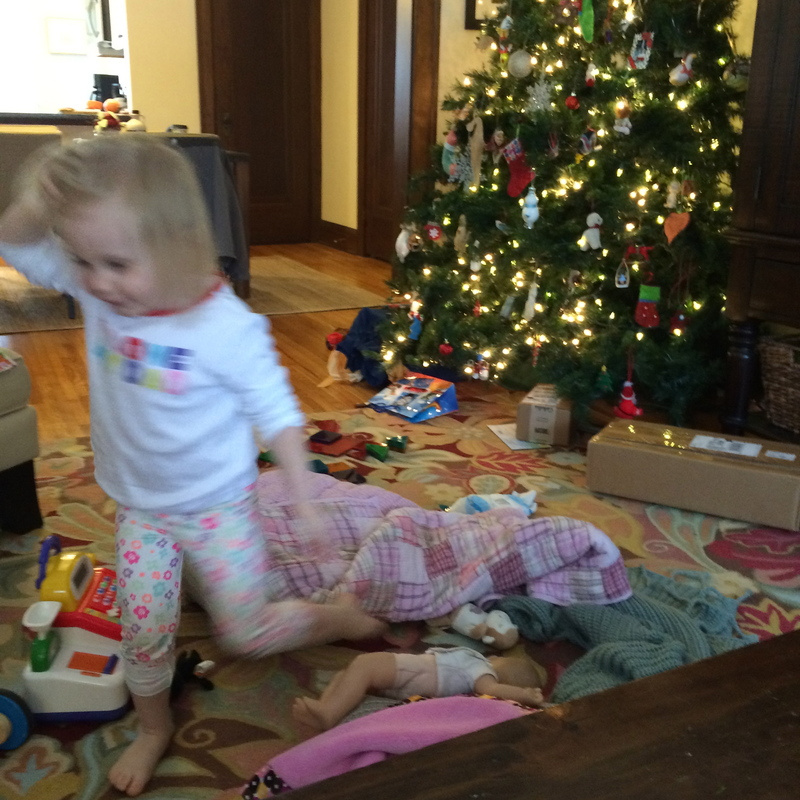 Christmas, at least the tepid non-gift side, should be a lot of fun. I just cannot believe how Emma is talking these days – full sentences, complete thoughts, etc. Ellen, I will be completely pliable as to whatever your plans are this weekend. Just tell me what to do and I’ll do it, including the cooking. Reid, I am completely thrilled that you’ll be down here for Christmas weekend. 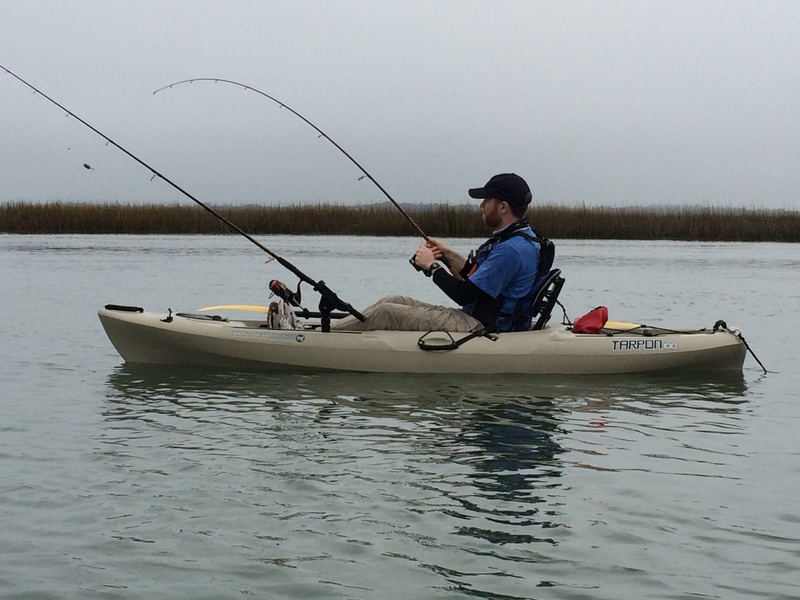 Charleston sounds like it would be a riot, and we’ll get a rental kayak to go with mine and we’ll shove off into the Intracoastal for some fishing. 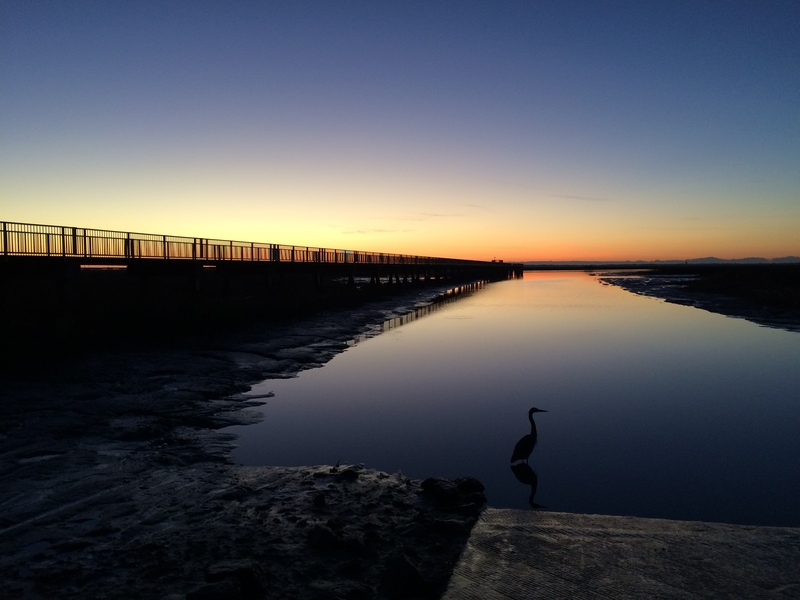 If you’ve not been to Charleston, you’re in for a treat. It’s a lively town with a lot to do, and hopefully, we’ll find some of that. The tree, such as it is, is up and I’m leaving the colored lights on 24/7 since it seems to cheer the place up a bit. There aren’t any gifts beneath the plastic boughs (why does a plastic tree shed? ), but gifts are almost beside the point at this stage of the game. I’m having some issues with my right hip which is a little disconcerting. It is noticeable almost all the time now and might be the residue of running and my recent few years of daily workouts. I’ve got an appointment early next month to see what sort of steps, if any, are necessary. It seems to be progressively more noticeable. I can’t blame it on the recent spate of gorgeous weather. It was well into the 60’s this weekend and today. It will make this evening’s walk a lot nicer – albeit a lot slower, too. Such are the wages of an aging body. I had to redeem some points earned at the bank for a few odds and ends, and ordered a machine that makes sleep-inducing noises along with a set of two-way radios and a headlamp for the mountains and some sort of solar charger/lamp I can use in my tent when I take trips on the Harley. Speaking of which, I will trek through the Midwest late next April or May, some of it to coincide with the birth of your little girl, Ellen. Okay, today’s note is shorter than normal (lucky for you) and I’m about to wrap up my retirement test drive with that stroll just mentioned. See you all sooner than later. Ellen/Reid: Holiday shopping for you guys feels like a mishmash of bland stuff; cash for your coat, Reid, and pre-natal yoga lessons you’re already using, Ellen. I’ve got a few other things but nothing you haven’t seen before. Really needed are ideas for Tim. I lost the eBay bid for the Thomas the Train set, Ellen, so I’ll take you up on your offer to go buy something for Emma next weekend. I’ll ship a few books this week. Honestly, I’m just drawing a total blank about gifts this year. Reid, it will be good to have you down here. We’ll head to the coast for some surf & beer. Ellen, that is such exciting news about a sister for Emma. It certainly makes your planning a lot easier in terms of wardrobe and such, although a kid brother wouldn’t have been bad. We could have called him Razzmatazz II in honor of your ‘bro. 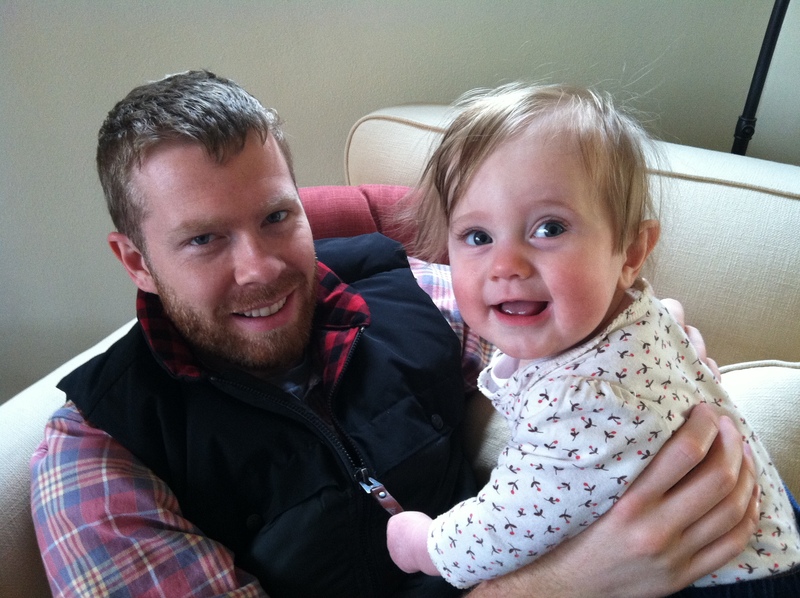 Reid and his equally feisty niece Emma have always had a special bond. Reid, you were just a terror on two legs. I mean, they might have named the Terrible Twos after you, you were that bad. I’ll try to make it up there in advance of the April date. On my walk last weekend I found a kid’s drivers license and debit card on the sidewalk. How those cards ended so close together in such a public place is beyond me, but a whitepages.com search revealed his landline and somehow I reached his dad. They came by and got the cards that were left under the front welcome mat. They gave me a couple of movie tickets which was nice and a fair exchange. I might bring those with me to Minnesota for you guys to use. The local community college, Central Piedmont Community College, is taking another flier on my teaching skills by letting me teach about writing. It’ll be just before and after I retire so I’m really looking forward to it. I kind of like the idea of helping in a classroom. I’ve got to figure out the Mac equivalent of Powerpoint so stuff can be shown on a screen. If you have solutions, let me know. Tagged as Central Piedmont Community College, Charleston, Charleston South Carolina, DIY, Hilton Head Island, Oak Island North Carolina, Sailfish Smackdown, Terrible Twos, Thomas the Train, Where's the beef? I don’t know if the kids are bored yet (a rhetorical question that does not demand an answer) with yet another story about ‘fishing.’ But at least this tale was about ‘catching,’ a wholesale change from prior fish-less excursions. 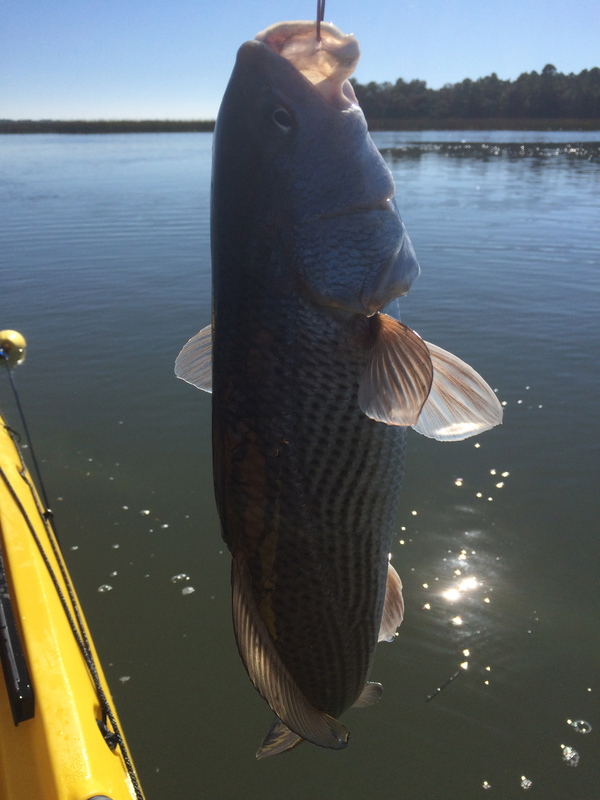 Ellen/Reid: As weeks go, this past one was pretty good; it was holiday shortened, the Thanksgiving meal was passable (grade B), and red fish were caught aplenty. That’s a fair triumvirate of good things in the stretch of a few days. It’s amazing what some sugar will do for the taste of pumpkin pies – as Ellen and Reid have discovered the hard way with their dad’s baking. 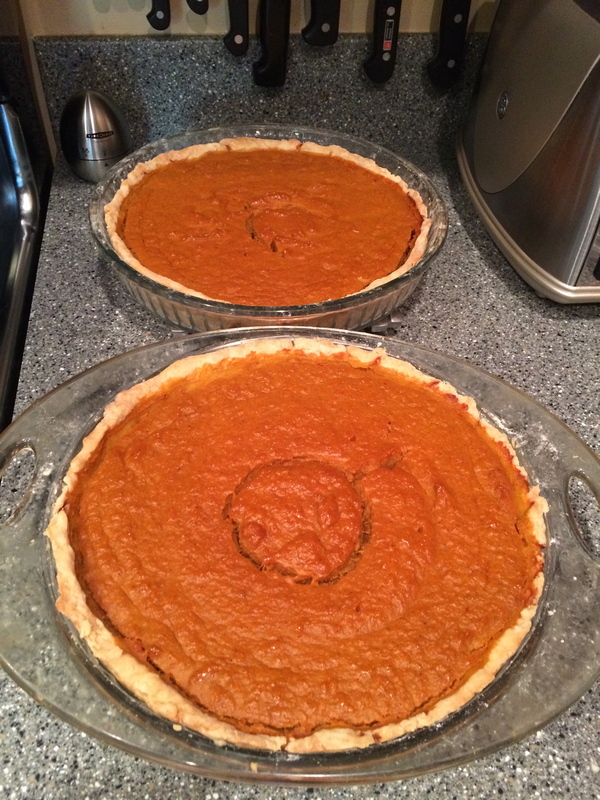 pumpkin pies (yes, I did add sugar this time). Most of the prep work (pies and stuffing) was wrapped up on Wednesday. That removed some of, but not all, the angst on Thursday morning. The only near-snag was I was hell bent to post my early morning walk on my trash blog and lost complete track of time about how long it would take to make bread. It was to be a three rise affair and I cut a couple of corners in order to get the loaves finished and the bird in the oven about noon. Things worked out okay but I nearly screwed the pooch right there. Reid, I recalled a photo of you slathering the turkey with butter a few years ago at Hilton Head and I repeated that performance. My friends got here about 3:45 – 4 p.m. and wine was liberally served so they might overlook any food faux pas. Everything turned out just fine and on time. The gravy was a bit thick and lumpy but that might be because the cook tipped back his share of wine. It still tasted good. 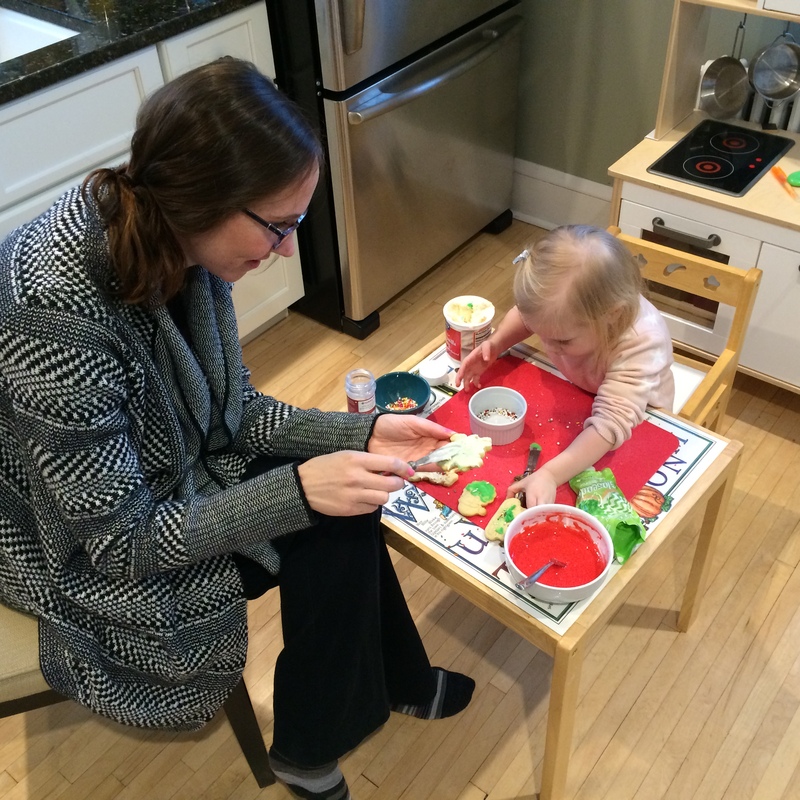 We sat around retelling the old stories, eating pie and creme brulee and it was a lot of fun. On Friday I hatched a plan to head back to Folly Beach for some fishing since only three of us were to play Saturday golf. I pulled the plug on that, which freed up the day. The beach forecast was favorable (60s) and the drive doable (a shade over 3 hours door to dock). The loading of the kayak atop the car and stowage of gear is becoming somewhat simpler. 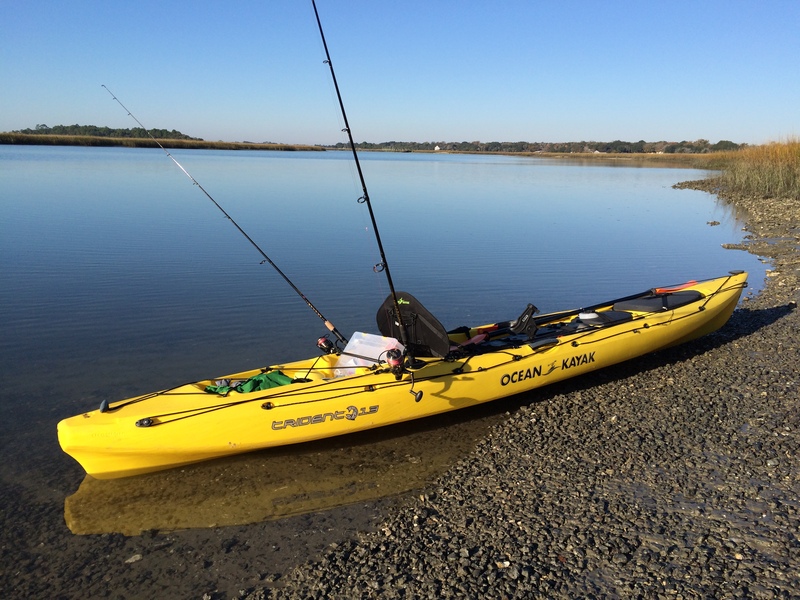 The Ocean Kayak Trident 13 may have looked rigged and ready, but self-induced fouled lines cost me an hour of fishing. I was pissed. I took bagful of frozen shrimp from the freezer and let it thaw on the counter. I woke up about 3 a.m., made sufficient coffee for a carafe and headed down the highway a shade after 4:00. It’s a pleasant enough ride down I-77 through Columbia to I-26 and on down to Charleston, which you skirt to the West and then finagle your way along Rte. 171 to an off the beaten path little road. I arrived in the parking lot (the bed of which is oyster shells), paid $2 to use put-in spot, and shoved off. But your dad makes so many, many stupid mistakes. I mis-handled the line on a reel and spent the next hour trying to undo the thing, cursing the whole time. It just cost so much precious time that could be better spent fishing. With no bites at the first stop (the pilings of a pier) I paddled a half mile away to another pier only to ram my kayak into the posts because I was unable to navigate through the strong tide. The mishap bent the eye guides on one rod and nearly broke the other rod. Two other fishermen watching me and must’ve thought ‘That guy is an idiot’ and they wouldn’t be far from right. The only catch there was a very, very small sea bass of some kind, so it was on to a sunken barge about 400 yards away. There was a pleasure boat anchored in the prime spot and they were catching all kinds of fish when I pulled up. But the bite for them stopped as soon as I anchored about 50 yards away and they left after an hour of catching nothing. I hopped over to their spot and all hell broke loose on my Harris Teeter shrimp. This beauty was 23 inches – well inside the slot. But it was a day to catch and release. 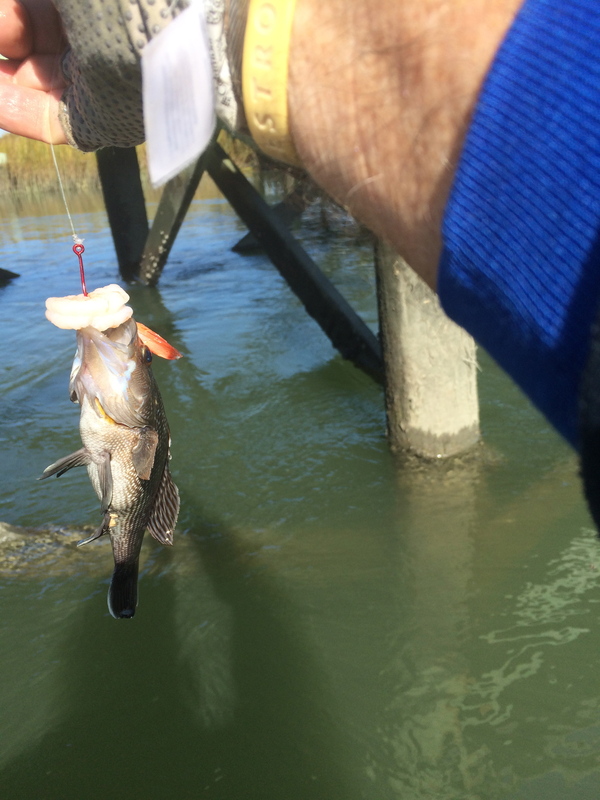 I caught 17 -18 red fish in the space of 90 minutes and lost a few more. The smallest was 14 inches and the biggest 23 inches. If I hadn’t made some other poor mistakes (bad knots, fouled line, etc.) no doubt the total would’ve been more. It was so exciting. I was yelling and laughing at the same time. All those other frustrating trips were old news. Ellen, tell Tim his advice on the guide was the best money I’ve spent on this. Tim’s comments that it’s ‘bad karma’ to keep a fish came to mind, so I let all the beautiful beasts swim away and free. Reid, you’ve got to get your sorry carcass down here because we can rent a kayak and rods. It’s time you and I headed to The Barge. Let’s do this – soon. 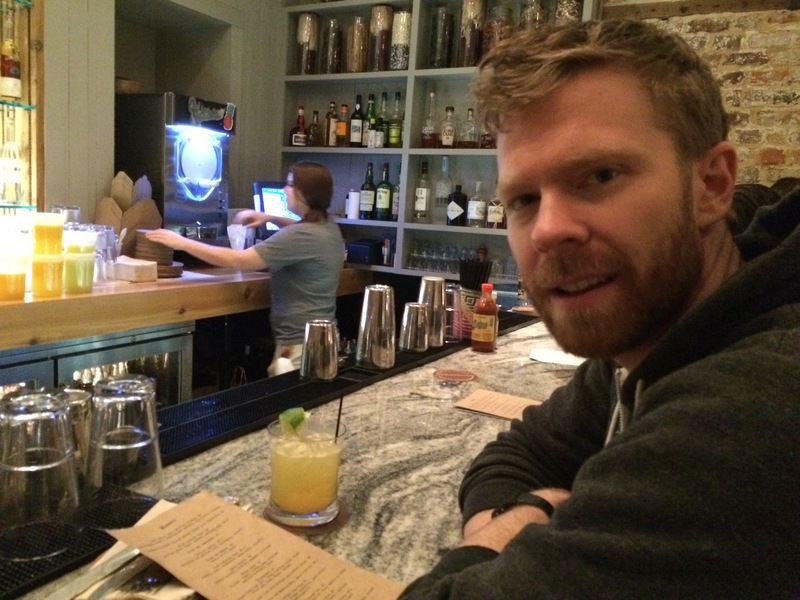 Only as Thanksgiving neared did I start to sweat the small stuff about the meal. Ellen and Reid have eaten their share of T-Day ‘mistakes’ but that’s why you prep the guests with wine – and plenty of it. Ellen/Reid: We endured the dreariest of days yesterday. It rained all day and it was very much on the cool side. My early-early morning walk was on the damp side but that’s why they make rain coats. You only have to look at the streams to tell the color of what we call soil; red clay. When it rains here it doesn’t fool around. The water comes down. Managed to eke out another copy of the Caldwell newsletter at the 11th hour. 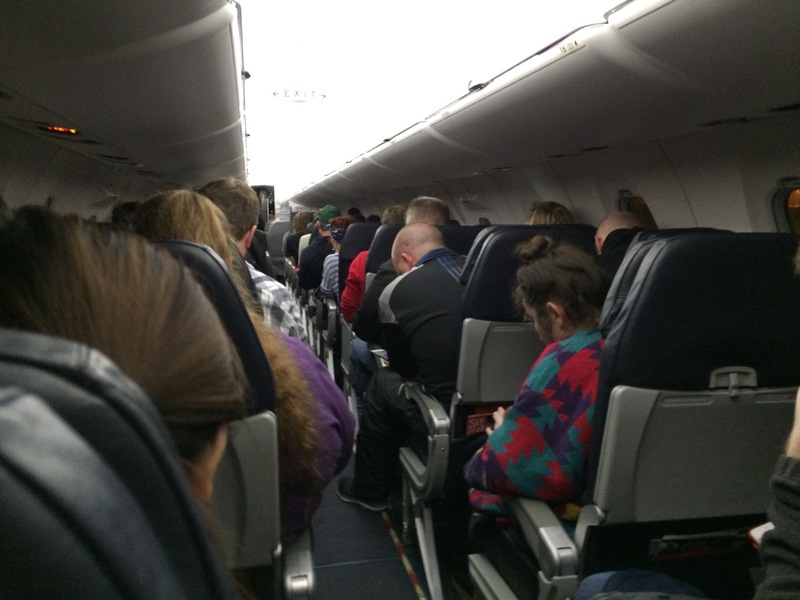 Ellen, John’s mother is not doing very well so he’s shuttling back and forth from CLT to her home in Atlanta. I’m not entirely sure what the situation is. The reality is settling in that I’m about to cook for a bunch of people on Thanksgiving. It’s different than fixing dinner for you guys since you’ll eat anything but these are my impressionable friends. They’ve never had to eat my cooking. All are folks who would otherwise be by themselves. All the makings of the meal are in hand and I’ll probably start to get to it tomorrow. 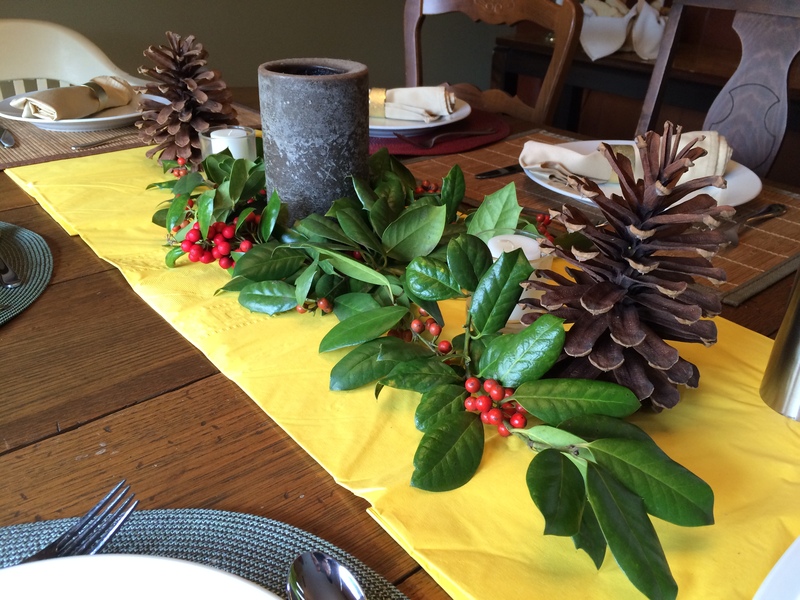 The Thanksgiving table was set with more than a little help from my friend Paula. My contribution was snipping holly just outside the back door. A pretty straightforward affair; turkey, mashed ‘taters and pan gravy, some fresh bread and I’ll yet again try another round of pumpkin pie. My pledge is to follow the instructions this time. The temptation is to always say ‘Oh, I’ll just add a little more of this or that.’ Wrong. The bird goes down for the count about 11-ish while some of my buddies play golf. We’ll eat about 5 or so while there’s still football to be seen. Alice will bring some cranberries while the others will uncork some wine. It will be good to have some people around the old house for a change. We’ve had another reshuffling at work. I’ve transitioned to another group and am somewhat unsure how I’ll fit in. Most of the new folks are in California so I’m pretty much the sole East coast presence. Given that the meter is running on my time at the bank, that’s okay. Most of what I do is to be folded into what others are doing. I’ll go along with things and try to not rock the boat too much. Speaking of retirement, Dave Hemminger has roped me into a sailfish-kayak tournament in Pompano, Florida in mid-January. It’s $150 to get in but you get a free tee shirt and drinks. Never in my wildest imagination, and I’ve got one, have I dreamt of fishing for sailfish from a kayak. It’s been tough enough to catch small fry let alone a snouted monster. I have absolutely no idea about lures, how far you go out, what sort of rods/tackle to have, etc., let alone what you’re supposed to do if you catch one of the things. Dave said there was one story of a guy who hooked one and was dragged for miles by the fighting fish. No need for the gaff on this little guy. If there was a smallest fish contest from this past Saturday, this catch would’ve won hands down. But it was far from my first – or largest fish. More on that next week. I’ve never kayaked on the open ocean before. Dave said he won’t fish but will paddle along. My $150 is largely a donation to the prize pool. But it does sound adventurous. It’ll be a fun way to kick off my golden years. Betsy and Bob just moved this weekend to a new rental house while they look for more permanent lodging. Their place sold in a flash. I need to get off the snide and do the same thing. One floor would be fabulous. Ellen, I unboxed the Chromecast last night – it only took a year to unwrap it – fully intent to set it up but got cold feet at the last moment since I’m not sure if it will interfere with my AT&T Uverse system. Probably not but I’m just not sure. People rave about Netflix and stuff. I rarely watch HBO and the other premium channels. It’s high time to let Uverse go. I think all I really need is an Internet provider. TV isn’t doing much for me these days other than wasting time. Okay, time to rock and roll. thanks for the Christmas list, Ellen. I’ll be on that this week. Reid, let me know about the winter coat you sound so much in need of.